It has been a week of "what if..." questions. For example, what if the hot weather of august that had me toddling about like a zombie suddenly vanished and we were left chilly and bleak? It hasn't really affected the bulb house where there is still a plastic bubble full of summer. Hippeastrum x acramannii started to produce a flower spike about ten days ago which is more or less typical for the clone and quite unlike the usual hybrids which flower in spring after a cool rest. Some observers report that it will continue to produce spikes until the first frost though it has never done so for me. The leaves will start to grow soon and will persist through the winter if temperatures permit. It may be that it inherits the behaviour from H. aulicum, an epiphytic species from southern Brazil and Paraguay which has a period of summer dormancy. 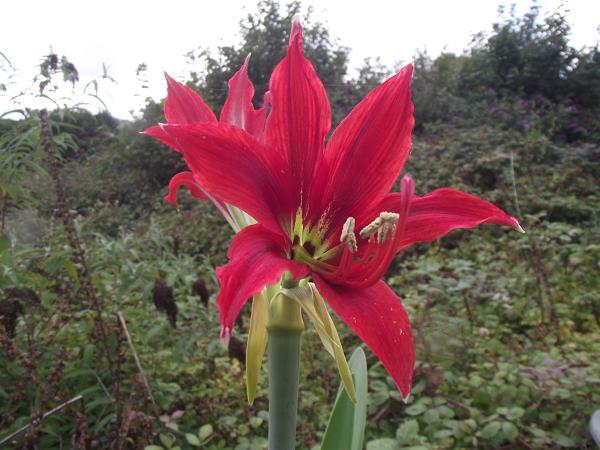 It is possible that the darker central stripe through the petals comes from the same source. And what if the cold nights left you unable to sleep? Well, eventually I accepted that it was no longer summer and got out a winter duvet. Bliss! Nerine masoniorum has spent the week consolidating the display. Last weekend there was a single flower, now the first Nerine of the season is making a good show (and has been joined by both N. filifolia and N. filamentosa). It is a small and simple thing and I am left wondering why I have never made time to go and see it in habitat. Questions flood over me and let's hope that the dry weather of summer doesn't lead to something more literal. What if the car doesn't pass its MOT? It has grown old in the time it has taken me to get used to it. I would miss it, and the 125,000 miles we have spent together. We could have driven five times around the world. Why didn't we give it a go, at least once? Surely an extra 20% on the fuel bill would have been worth it? I could have gone to East Cape Province in South Africa where the only known location for N.masoniorum is under threat from land development and agriculture. Fortunately it is easy in cultivation but it would be nice to see it in habitat while it is still possible. In South Africa it is completely deciduous in cold winters, but in the greenhouse here it is evergreen. Nice to grow something that isn't in danger of freezing to death in winter. And the car? Needed a new light bulb but passed the MOT for another year. We really should just pack and go while we can. The Steppes, Prairies and possible even the Taiga are home to a wealth of large, ornamental herbaceous species that have magnificent charm. In habitat I am sure they are more or less feeble, producing occasional dull flower spikes among the all conquering grasses, but in cultivation we remove the competition and they burgeon. It must take a very accomplished person to spot them in habitat and understand their potential. Perhaps that is why they have been so slow to take off as garden ornamentals. Communication has been the key. Now we understand what is possible we want it! 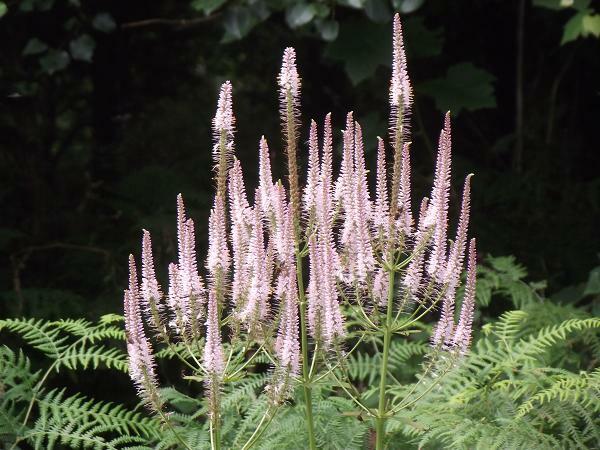 It remains true that they are adapted to very hot summers and very cold winters, so Cornwall does not suit all of them but Veronicastrum virginicum seems to adapt. It isn't as vigorous as it could be, but it remains spectacular. 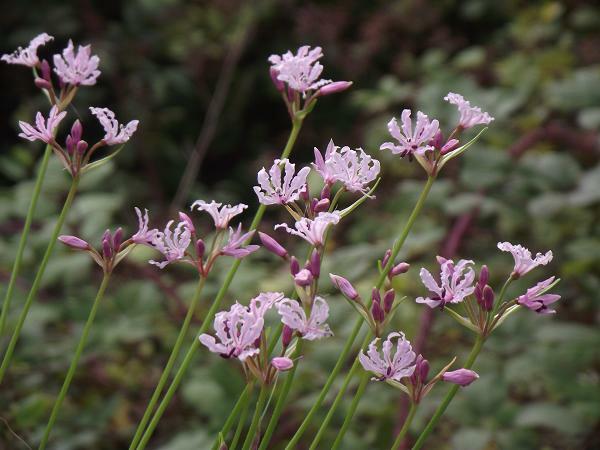 I grow 'Roseum' because it was the first cultivar I ran into once I decided to give them a try. Next time I see another, I will get it. I might even order some online. So what would you do if your internet connection went down? It has been a frustrating week, and BT (bless their cotton socks) tell me it is just hard luck and I must fix it myself. They didn't actually tell me to **** off but I sensed they were coming close. Another good reason to set off round the world. And some small black flowers to end a complicated week. 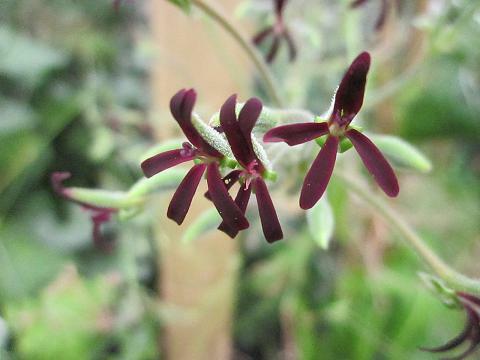 I have terrible problems photographing Pelargonium sidoides. The camera refuses to focus on the dark petals and insists on looking past them to the background. It is frustrating and this darkest (and smallest) form of the species would have appeared in these notes very frequently if I was able to get reliable pictures. The larger flowered form of the species seems to be cold hardy. There is a large patch of it outside the Princess of Wales conservatory at Kew, and it is expanding. I don't know if it would survive the wet of winter here, but it will be tried. It has much broader petals of dark magenta purple that the camera has less difficulty identifying at the subject. I can't complain, it is a good camera though it is reaching the end of its life. What if I didn't have it, how would I write this page (that I can't upload to the internet anyway)? On wednesday I found out. Photographing Sarracenia for the record (it has been three years since I last photographed the whole collection) my arm got caught on a sticky pitcher and I dropped the camera in the water tank. I have been thinking about a new camera anyway, so perhaps this is the push I needed. I took it apart as far as possible and left it on the side to dry out. This morning the screen cleared and it started to work again, so all credit to Canon. I celebrated by taking this picture and for the first time in several years the camera decided to focus. What if? You never really know the consequences.